Hire White Starlit Dance Floor Hampshire and Surrey areas, perfect for Wedding Receptions, Civil Partnerships, Birthday Parties, Corporate Events, Christmas Parties and Large Events. LED White Starlit Dance Floor are ideal for corporate functions for branding names and logos. 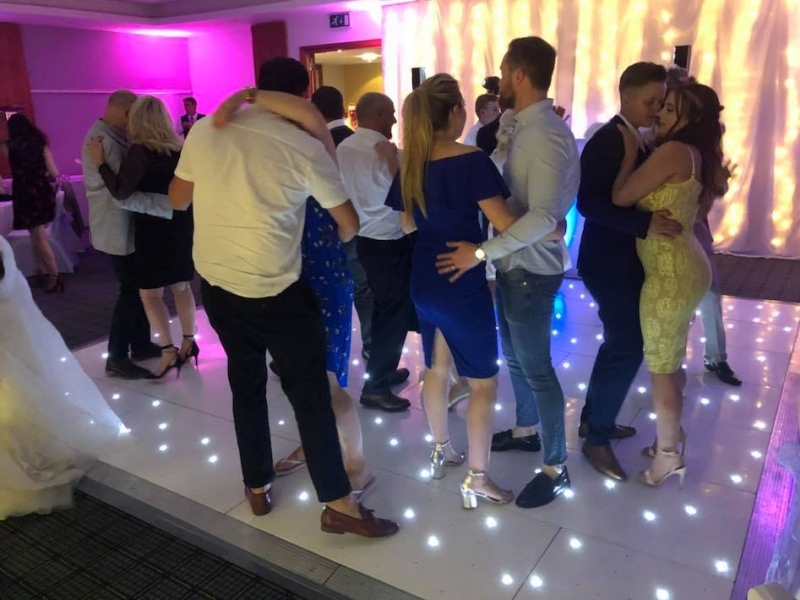 We offer Dance Floors from 12ft x 12ft to 16ft x 16ft available to hire in the Hampshire, Surrey, Berkshire, South Coast, Dorset and London area. Our Starlit Dance Floor are operated by remote control to create various effects, including a beautiful random twinkling effect (at six different speeds) to ensure your white LED dance floor twinkles beautifully in a random pattern. Each white starlit dance floor is non-slip, wireless and water resistant. (Indoor use only). The Starlit Dance Floor requires one standard plug socket. Along with looking simply amazing, the floor also gives a great source of light that means you can drop down the harsh wall or ceiling mounted lights and give your venue a striking visual look. When looking for dance floor hire Hampshire and Surrey area we pride ourselves on offering the best service and dance floor around which is why we use the latest wireless LED dance floor system available. The advantage of our new wireless panels is that a 14ft by 14ft floor can be laid in just 1 hour this giving wedding receptions and corporate events quick-turnaround flexibility during allocated room turns.